Carolynn Doan has been a professional artist for over 25 years. During this time she has lived in British Columbia and is now based on the Sunshine Coast in the beautiful village of Roberts Creek. Carolynn was born and raised in Saskatchewan and is proud of her prairie roots. These roots are the foundation upon which she has built her artistic career. As a child she spent many hours roaming through fields, getting to know the land and the vast prairie skies. She believes it is this freedom and exposure to the natural world that has influenced both her education and the art she creates. Carolynn holds a degree in Science (BSc) from the University of Regina. This background is evident in the choices she makes when developing ideas for paintings. 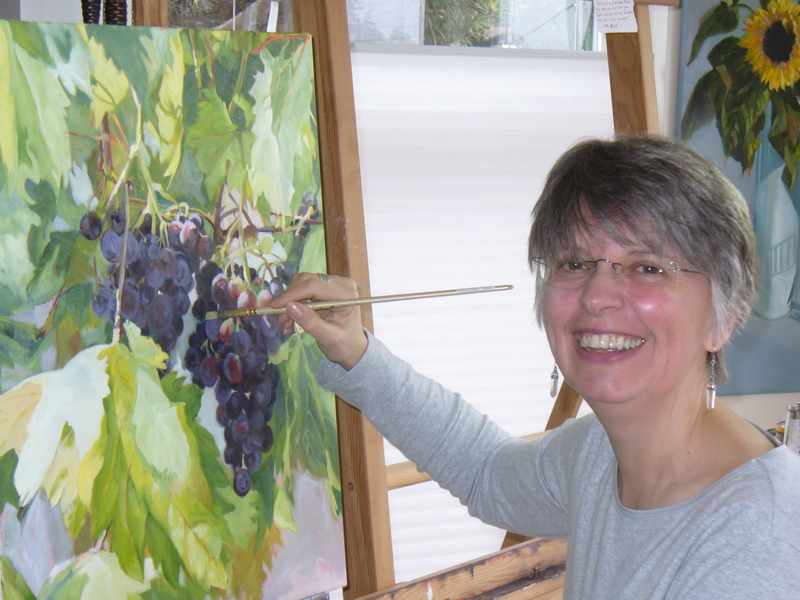 ‘I see my painting career as a natural progression from the study of the natural world. This study taught me to look carefully, be investigative, to question, consider and to refrain from judgement wherever possible’. Carolynn has had an interest in art from an early age. Being a self taught artist has offered its benefits. ‘Not actually knowing the rules makes it quite easy to break them’. Carolynn’s work has been featured in articles in the Peace Arch News by Michael Skog and Alex Browne. Her painting was the feature for Canada’s 138th Birthday Celebration in White Rock, BC. She has taken part in many juried competitions and shows most notably those of the Federation, Artsolutely Fabulous for 6 consecutive years, Breath of Fresh Art, Arts council of Surrey where she won awards in both Arts’99 and 2012. She was also an award winner in Euphorbia and the Federation of Canadian Artist juried shows. Carolynn’s work hangs in private and corporate collections in Canada, Great Britain, the U.S.A., Germany and Japan. People often ask me how I came to be a painter when my education was in science. My degree was a major in biology and a minor in mathematics. On every occasion I tell them that ‘I see my painting career as a natural progression from the study of the natural world’, which is what the study of biology is. It also taught me to look carefully, be investigative and have a child-like wonder for the way things appear to be. It taught me to question, consider and to refrain from judgment wherever possible. That discipline helped to teach me about my undeniable connection to all living things. It has filled my heart, and my brush with the joy of being in the presence of the miracle of the natural world. As an artist, I strive to represent those aspects of nature that touch my emotions and attempt to pass those feelings on through colour and light. I tend not to categorize myself as a landscape, floral or animal painter. I enjoy the investigation and challenge of painting almost any subject in a variety of media.